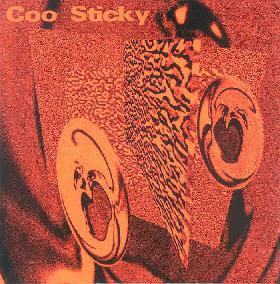 Charles Rice Goff III - "Coo Sticky"
Coo Sticky consists of 26 tracks of various collaborations between Charles Rice Goff III and Eric Matchett, Killr Kaswan, Mike Adams, Bret Hart, Eric Wallack, Hal McGee, Brian Noring, Don Campau and Mark Kissinger. Charles produced the album by editing and mixing samples of acoustic instruments and (mostly) non-electrically created sounds to create a mish-mosh of sound-art fun. The collaborators supplied the raw sounds and Dr. Charles performed the surgery. A Bluesy Bret Hart guitar gets overlaid with strange off-key voices. The always phenomenal guitar of Eric Wallack is paired with space waves and, of course, oddball voices. Guitarist Mark Kissinger gets ganged up on by Charles, Brian Noring and Hal McGee. Hearing free-improv guitar stylings serving as the backing for Charles belting out a song with wacky lyrics is something unique indeed. Well... the burps and farts were a nice touch too. But I think the guitar tracks were definitely among my favorites as they provided fodder for some of the best blending of contrasts on the album. Hal McGee and Charles' "Little Purple Pills" is by far the longest track of the set, and is a wild mixture of string noodlings and scratching techniques, assorted sounds, and layered rambling narrations, the robotic voice monolog being pretty hysterical despite my having difficulty following it. Another highlight is the tribal, spacey, mindfucked "Beyond The Onion" by Charles, Hal and Mark Kissinger. In summary, I give Coo Sticky an A+ for being completely nuts and having loosened me up after a long crappy day at work. It's a big glom of weirdness in which all the many pieces somehow seem to fit together like a glove. Of course you have to approach this with a sense of fun and appreciation for the kind of wild eyed tape editing that chuckles to itself knowing that it's creating something weird but putting a tremendous amount of craft and care into the process. Carnival groupies will love this album. Sound-art and tape manipulation fans will find much to enjoy too.